220 pages | 13 B/W Illus. This book explores the implications of Pierre Bourdieu’s sociology of cultural production for the study of translation as a socio-cultural activity. Bourdieu’s work has continued to inspire research on translation in the last few years, though without a detailed, large-scale investigation that tests the viability of his conceptual tools and methodological assumptions. With focus on the Arabic translations of Shakespeare’s tragedies in Egypt, this book offers a detailed analysis of the theory of ‘fields of cultural production’ with the purpose of providing a fresh perspective on the genesis and development of drama translation in Arabic. The different cases of the Arabic translations of Hamlet, Macbeth, King Lear and Othello lend themselves to sociological analysis, due to the complex socio-cultural dynamics that conditioned the translation decisions made by translators, theatre directors, actors/actresses and publishers. In challenging the mainstream history of Shakespeare translation into Arabic, which is mainly premised on the linguistic proximity between source and target texts, this book attempts a ‘social history’ of the ‘Arabic Shakespeare’ which takes as its foundational assumption the fact that translation is a socially-situated phenomenon that is only fully appreciated in its socio-cultural milieu. 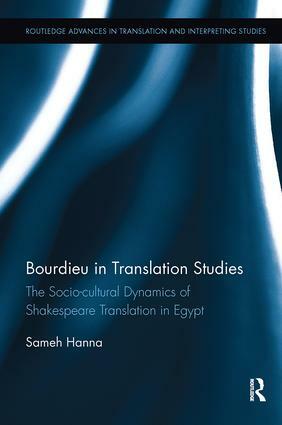 Through a detailed discussion of the production, dissemination and consumption of the Arabic translations of Shakespeare’s tragedies, Bourdieu in Translation Studies marks a significant contribution to both sociology of translation and the cultural history of modern Egypt. Sameh Hanna is a lecturer in Arabic literature and translation at the University of Leeds. His research interests include sociology of translation and Shakespeare translation into Arabic on which he published a number of peer-reviewed articles and chapters in edited volumes. He also published a new edition of the first Arabic translation of Hamlet, with an introduction. This series is our home for innovative research in the field of translation studies. It includes monographs and targeted edited collections that provide new insights into this important and evolving subject area.